If you are concerned about your privacy and upload images to dating and photo sharing sites you should read this article by John Mosley. 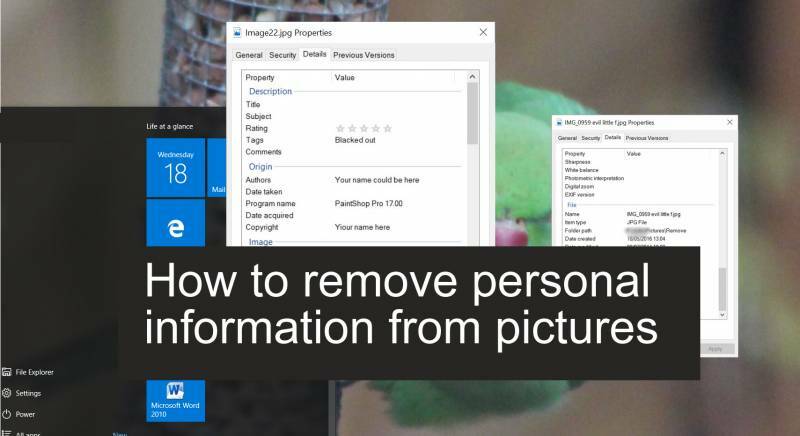 You’ll find out how to easily remove personal information from pictures you upload or share. You probably didn’t know this, but every time you take pictures with your digital camera or using the camera on your smartphone, pieces of information, such as the location where the picture was taken, date and time, and camera settings are saved into the file along with the image you captured. This kind of information is typically stored as EXIF (Exchangeable Image File Format) metadata which is part of the image file — typically for JPEG format files. Properties that can be stored as EXIF metadata will vary on the features supported by your camera, but usually, it will include GPS location coordinates, date and time, the application used to create or edit the file, and camera info like make and model, aperture, ISO speed, and focal length. For most users (and most uses), this isn’t a big deal, but sometimes you’re better off stripping the date, time, place or other info from a picture before sharing it. Some pictures that you have edited before sharing or uploading may also include your name, or your computer’s name. This ‘EXIF’ and especially geotagged data, says a great deal about the photographer. You may or may not want to share all that information. Particularly if you are uploading pictures that could be embarrassing, or even if you don’t want someone to know where or when the picture was taken. Do you want someone to know the horny shot you have on your profile was taken ten years ago? Some sites may automatically remove this data, but not all will. And if you email a picture, the data usually goes with the image. It goes to say that you should bear in mind what’s in the background of an image too. For example, if you are not out at work, and post a shot taken there, check to make sure there isn’t a company logo in the background. It’s easy to view and remove EXIF data. 1 Select one image, then right-click the mouse and select “Properties.” It’s at the bottom of the dialogue window. 2 Select the “Details” tab. In this section, you can examine EXIF metadata available for the particular file. 3 Click the “Remove Properties and Personal Information” link, at the bottom of the dialogue box. You’ll then notice that there is also a ‘Create a copy with all the possible properties removed’ option, but a bug makes this option unusable in some versions of Windows 10. Click OK to remove the selected information from the image’s EXIF metadata. If you want to remove all possible info, just click “OK” to create a set of copies identical in every way except for the identifying information. If you’d rather choose which info to keep and which to delete, select “Remove the following properties from this file” at the top and then scroll down the list to select the info you want to remove, then click “OK.” This does not create a copy, so preserve the information externally if you think you’ll want it later! You can remove personal information from pictures embedded in one or multiple images at the same time. Gather the pics you want to protect in one folder. This isn’t strictly necessary, but it does make your life much easier. If you want to delete the same properties on multiple files, just select the files you want to edit, or select them all (CTRL + A), right-click on them, click Properties, and continue with the steps listed above. If you need help to remove personal information from pictures, please get in touch. One-to-one help is available in your home or over the internet using a secure link.